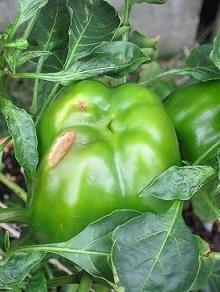 What could be causing rot to appear on the skin of my bell peppers? 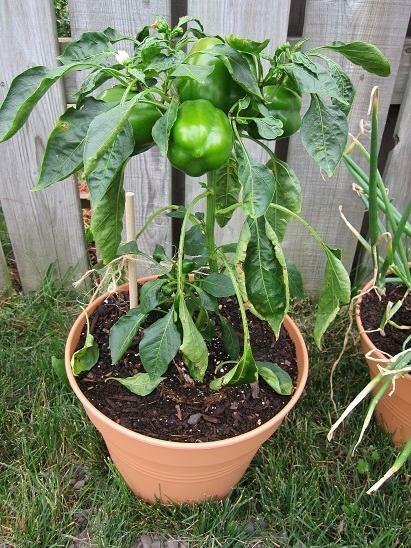 I have a set of four bell pepper plants that I am growing in 12" containers in my backyard. They've been growing alright until the fruits on the plants have started to develop what appears to be a rot on their skin. What could be causing this? I water them well every two days and they get 6-7+ hours of sunlight a day. This is my first time ever growing vegetables by the way. This is almost certainly blossom end rot (BER), a disorder that is usually caused by fluctuations in the plant's water supply, leading to a calcium deficiency. It affects a number of plants, including tomatoes, squash and eggplant. 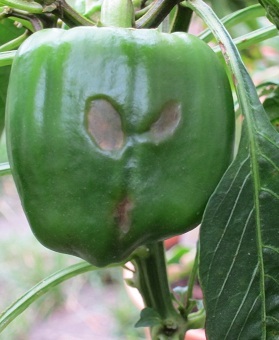 On peppers, the lesion is usually a tan color in the early stages, later turning brown or black, and can affect the side of the fruit, as in your first photo, as well as the blossom end. You're right to water your plants thoroughly (superficial watering could cause them to surface-root, and become stressed), but once every two days may be over-frequent, unless, of course, the ambient temperature is very high, and the soil/compost is drying out very quickly; it should be slightly damp most of the time, not wet. Over-watering washes calcium out of the soil and is another cause of BER. Not the answer you're looking for? Browse other questions tagged diagnosis peppers containers or ask your own question. What else besides calcium deficiency could be causing tomato blossom end rot? When will my tomatoes be ready to harvest? What are these blemishes on the skin of my bell peppers? What is this discolouration of the skin of my pepper? What is causing a white rash to appear on the leaves of Pedilanthus tithymaloides? How do I get rid of pill bugs in my vegetable garden (or is it even the problem)? What are these swirly green growths inside my bell peppers? Can blossom end rot appear on side of pepper?